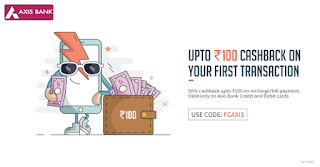 Freecharge – Get 100% Cashback on First Transaction via Axis Bank Cards (New users), Yes now Freecharge has come up with a new offer, Who have Axis Bank Debit & credit card will get 100% cashback on recharge & bill payments. Maximum Cashback is Rs 100 per users. Offer Valid for new users only. So Hurry up !! 4). 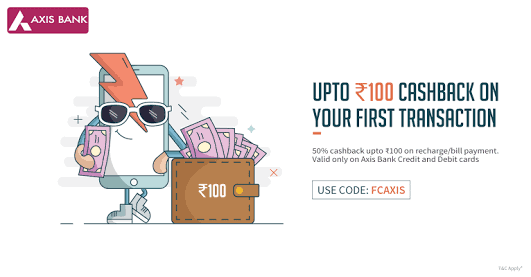 Apply Promocode: AXIS in Promo code section. 1. 100% cashback on Freecharge on Recharge/Bill payments done till 30th April 2018.